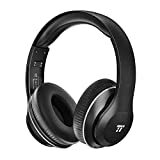 The TaoTronics Wireless Headset Over Ear Headphones are a crazy-good value on a normal day. They offer big sound with 40mm drivers, on-ear controls, integrated bass EQ, and 15 hours of battery life for just $40. On Wednesday however, for one day only, they offer all that for just $25.49. That’s an all-time low for these hot new headphones, and it’s only good until the end of the day or until they sell out, which is a definite possibility.